Hunting for mice is still good in the withering grass in smaller and peaceful forest clearings or in meadows. 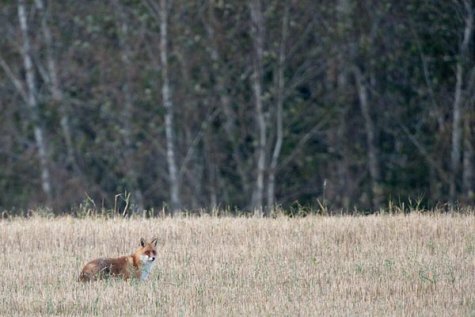 The female, vixen, moves alone in her territory until the mating period in February. “Mouse odour” can even be felt by a human nose, the fox with its extraordinary sense of smell maps its hunting grounds by it. This year there are enough small rodents; it seems that foxes prefer the taste of voles but find no reason to be fastidious if a bank vole (Clethrionomys glareolus), yellow-necked mouse(Apodemus flavicollis) or water vole (Arvicola amphibius) is the prey instead. Its hunting is a worthwhile sight in itself, difficult to describe – it must be seen. The fox already wears its winter coat – the most splendid of the year.